Among the priority hazards of joining capital and technology the way we do in the 21st Century is that it can blow up the ordinary and familiar — a farm, for instance — into shapes and sizes that are extraordinary. That is what’s happening in Michigan and in many other states in animal agriculture. American meat, poultry, and milk, increasingly, are produced on immense sites that have come to be known as “factory farms.” For those who haven’t followed this development, one problem is that confining huge numbers of animals produces quantities of manure that often exceed the levels of raw sewage produced by major cities. A second problem is that neither the federal government nor the states require modern waste water pollution controls. Owners of factory farms, several of them multi-billion dollar food companies, have convinced state legislators they are mere farmers, unable to afford the settling basins, digesters, and filtration equipment that municipalities have used for years to clean their waste water. Instead they generally dump manure into smelly lagoons that inevitably leak and pollute the nearest stream or lake. In this edition of Flip, Mode Shift’s spotlight of useful applications of Internet technology, we draw your attention to the interactive Factory Farm Map, which details how many factory farms there are in the United States, and does so state by state, county by county, and sector by sector. The map, for example, can show you have many factory dairy farms there are in Barry County, Michigan (3), the number of factory hog farms in Allegan County (38), and how many cattle operations exist in Huron County (13). The Factory Farm Map is a genuine breakthrough in data gathering and presentation for a sector of the agriculture industry that is deserving of the pubic attention it is starting to attract. My organization, the Michigan Land Use Institute, has been interested in factory farms since our founding in 1995. Patty Cantrell, who wrote “Hog Wars,” a first-of -its-kind report on the subject while working for the Missouri Rural Crisis Center early in her career, brought that expertise to Michigan in 1998 and helped build the statewide campaign to limit the expansion of factory farms. Three years ago, Stephanie Rudolph, an intern from Haverford College then and now a graduate fellow at the Institute, reported on the worst of all factory farm polluters in Michigan, the Vreba-Hoff dairy farms of Hillsdale County. In 2004, Governor Jennifer M. Granholm’s administration brought sanctions against the farm that have curtailed pollution. Another aspect : look into corn ethanol projects. Byproduct of the process is low quality cattle feed. 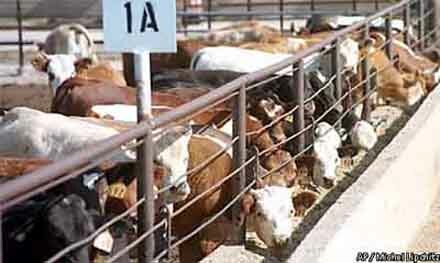 It is most economical to place a feedlot next to the ethanol plant rather than incur shipping costs. Result : groundwater contamination. Ethanol process needs water, manure waste contaminates it. That’s relevant here because a company with plans to build a refinery in McBain is now talking to several farm operations about setting up operations, according to Rick Johnson, a partner with NextGen Energy LLC of Livonia, Michigan. “We’ll take [the corn byproduct] offsite if we have to, but we’d prefer not to do that,” he said. My humble opinion on ethanol: scrap protection for Florida Sugar, allow imports from Brazil.